One of the most important options to configure in our mobile device is the language. 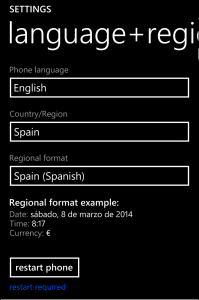 Windows Phone allows us an easy way to change the phone language and adjust it to our personal preferences. Available languages depend on the phone model and the country where we have acquired it, so not all the possible languages are always available to any smartphone. That means that if we buy a device in a foreign country, we must check that the language we are interested on is available. 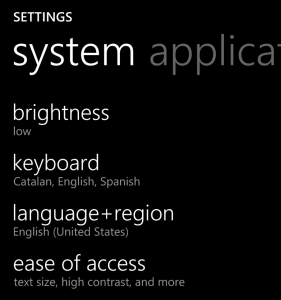 To change the language of a windows smartphone or tablet, we have to go to the settings menu and look for the section “language and region”. Once there, we will be able to choose our language from the list of all available languages. We must select the desired one from the list and we will automatically see a message that asks us to reboot the device for the changes to take effect. Until we reboot the device, the language will not change. There are other features of the mobile device that depend on regional characteristics, such as the result of searches on Bing. These depend on the regional settings, and the results match the country where we are. We have to give permissions to Bing so that it can properly locate our position. Another example is the calendar. We can choose the format of date, time and currency in which we see the information, and those change depending on the country. We may need to set the correct format for the language we have chosen for the phone, as this option is not linked automatically with the phone language. From the menu “region and language” we have the option to configure the regional format for dates, times, and currency.